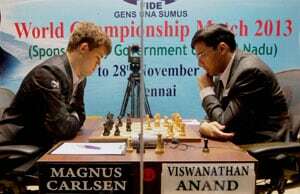 Victory eluded him yet again but defending champion Viswanathan Anand said he was relieved to eke out a draw after two losses on the trot against Magnus Carlsen in the World Chess Championship here on Monday. "Obviously after the last two games it's nice to break this result but I was hoping to be able to press him a little but I could not manage," Anand said in a press conference after the seventh-round game here. Carlsen almost echoed the opinion. "Not so much more to say, we both have played this line, there are many different plans of course. But whatever you play it's usually quite slow and the game goes on. I thought I was doing more or less fine, just a little bit worse but not much. It's just going to be a bit more pleasant, but my pieces are well developed," he said. Anand said he will definitely keep trying and push for a win. The eighth game will be played tomorrow followed by a day's break.